Lazies, Make an easy DIY Easter basket by adding a handle to our Button Boats. With the simple addition of an easy handle, our Button Boats make perfect Easter Baskets (and gift baskets)! I’ll show you how to add a handle for perfectly Lazy Easter goodies. You’ll need the Button Boats pattern LGD138 in addition to this tutorial and some extra supplies to make the handle. Grab the FREE printable tutorial below! You don’t need to make any changes to the project as it is shown in the Button Boats pattern. Simply identify which of the three boat planks will be the two outside planks or the center plank. Add ribbons to the outside planks. Add the handle to the center plank. 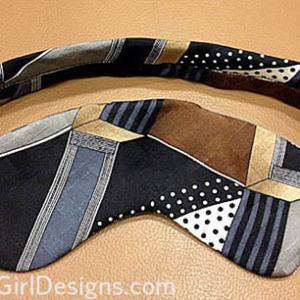 Construct according to the pattern, add the ribbon embellishments and create/attach the handle where shown in this tutorial. Then fill your beautiful baskets with love and enjoy! Make your Button Boats sandwich of fabric and interfacing according to the pattern. Cut planks and stitch edges according to the pattern. Before proceeding, make and add handle and ribbon embellishments as shown below. You’ll need some extra supplies to make another small sandwich, then cut a handle 1 1/4″ x 9 1/2″. Zigzag stitch the edges of the handle. Center the ribbon on the handle (below left), and on each of the two outer planks (below right). 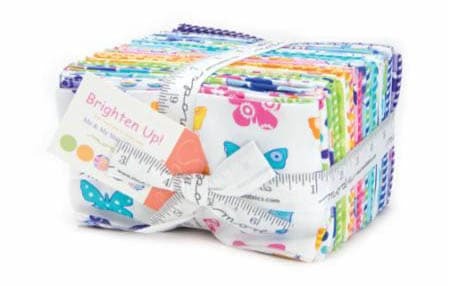 Topstitch through all layers close to both long edges of the ribbon.Finish the cut edges with a zigzag stitch to control any fray at the end of the ribbon. Handle is attached to the center plank on the ‘Inside View’ on page 3 of Button Boats pattern. Center the handle on top of the center Boat plank. Zigzag along both ends of the handle to attach it to the plank. Add Buttons and Finish Up! After adding the handle and embellishing the sides, complete the project as directed in the pattern. Don’t forget your beautiful buttons (Snack Packs from Just Another Button Company). Actually, the handle is ‘hinged’ to the center plank of the Button Boats at the ends by the zigzag stitching. When the boat ends are tied together and the boat comes to life, simply lift the handle up and away from the plank. I love this – even with the addition of the handle, the Button Boats still packs flat for easy storage. Untie the ends and the whole Button Boats packs flat so you can take it with you or store it away. Button Boats where the decorative ribbon was stitched to the project. The handle can be added during construction, or afterwards. That means you can use the bounty of Boats you’ve already made and add a simple handle to basket-ize them. This Basket Handle Tutorial is available as a FREE download at the end of this post. Shops: Contact me directly about using this tutorial for your shop. Adding a handle to Button Boats is great for everyday use, or other themes: baby shower, Halloween, Thanksgiving, birthdays, etc. 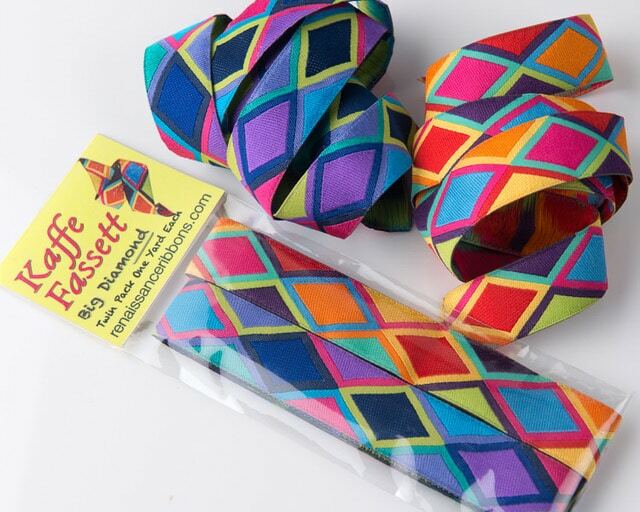 My inspiration for these beauties came from these amazing Renaissance Ribbons designed by Kaffe Fassett, available here. You need one yard of ribbon per boat. I paired the ribbon with some yummy brights from ‘Brighten Up’ by Me and My Sisters Designs for Moda Fabrics. Post a comment and tell me how you will use Button Boat Baskets. Please like and share this post with your stitchy friends. 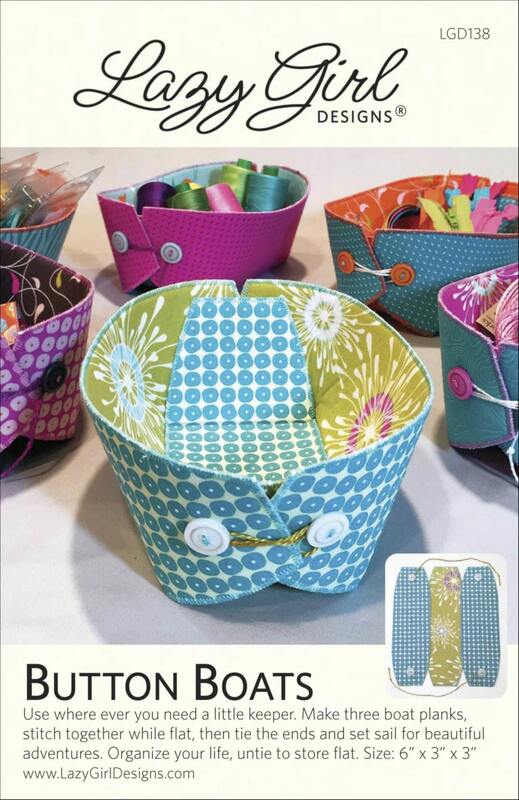 Now, grab the FREE printable tutorial below, then keep it with your Button Boats pattern for safekeeping. Really cute! How smart to use the pretty boats to make small easter basket-pretties! Absolutely LOVE them!!! These are so cute! 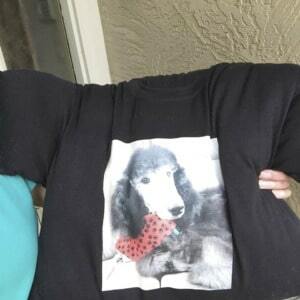 I might have to make one for my grandson! Also, thanks for the free tutorial via Craftsy! 😀 You’re the best Joan!